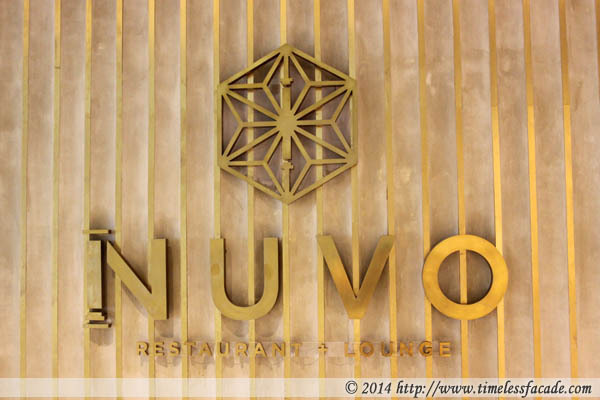 Nuvo was offering an irresistible deal on their set lunch @ $13 (apparently until end February 2014) so we dropped by for lunch one Saturday afternoon since we were in the vicinity. Helmed by Chef Mark Richards, former chef de cuisine of Keystone Restaurant, Nuvo falls under the same management (Caerus Holdings) as that of Lady M (which I personally like) in Singapore. 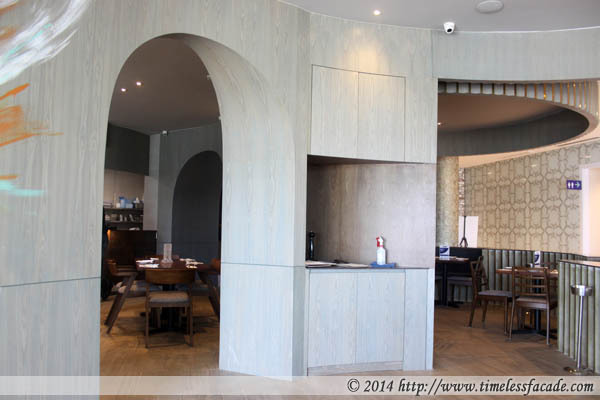 Hidden from plain sight in a corner of the newly opened "The Dining Edition" in Marina Square, Nuvo's interior utilises quite a bit of wood, which gives it a more down to earth feel. The open concept kitchen offers diners an opportunity to watch their food being prepared if they so wish but honestly, it would be weird hanging around the serving counter. 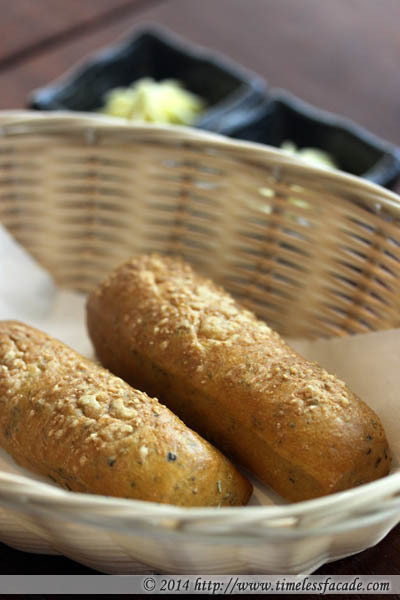 Complimentary Bread - The complimentary bread was warm and crusty with hints of Parmesan. Pretty decent especially with a thin spread of the accompanying Nori butter. A pity each person was only accorded one roll. Warm Japanese Mushroom Salad - This dish honestly didn't look like much but it sure was nice. 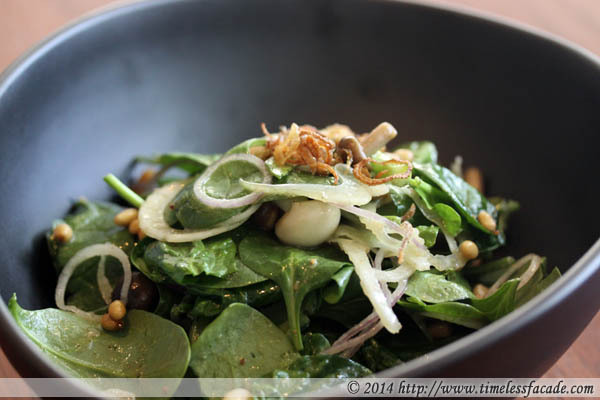 Tossed up with pine nuts, asparagus, shallots and Japanese mushroom, the salad (baby spinach) had a pleasing, savoury sweet note to it. I have honestly never been so enamoured with a salad. And I say this from having the salad on 3 separate occasions @ Nuvo. 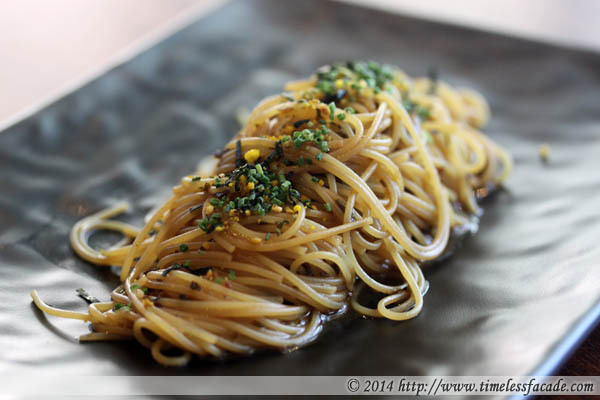 Angel Hair Wakame pasta with Lobster Essence and Rayu Oil - One of the signature dishes at Nuvo, the angel hair pasta had a nice firm bite to it, soaking in the mild spiciness of the rayu oil (chilli oil) and the sweet saltiness of the wakame (seaweed). Overall a very flavourful pasta dish that had me reaching for my glass of water a little more frequently due to the higher than acceptable (apparently only to me) salt content. And strangely enough, it is marked as a vegetarian pasta dish (how about the lobster essence?). Lobster Risotto - Another signature dish and one that is close to my heart (and mouth). The lobster risotto is only available on the ala carte menu and a small serving (as per my picture) will set you back by $28 while the larger one is about $36 if my memory serves me right. It was a simple yet well executed dish. The risotto was nicely al dente, cooked in a rich lobster broth with small chunks of lobster and edamame - creamily good! Well worth the money in my humble opinion. Pocky Ricotta Cheese Cake - This dessert was rather interesting, with the top of the cheese cake adorned with chocolate swirls and the base made from crushed Pocky (yes, the $1 box of Pocky you can get from supermarkets). But all the bells and whistles aside, it just tasted like a light, decently made cheesecake that provided a nice, sweet ending to our meal. With a price tag of $13 for an appetiser, main and dessert of above average quality, what's not to like? Service was good as well but intervals between the dishes could have been shorter. Also, the website states opening hours from 11am to 11pm but they didn't open until 12pm during this particular visit. And such things definitely don't leave good impressions. But having said that, I'll definitely return to indulge in the lobster risotto and to sample other offerings.